“A Murder is Announced”—the hit show performing this weekend at SCT, has nearly sold out! Chieftain Alley at 5:30 p.m. at the Boys Basketball Tent. Get fueled for the game and support our basketball teams! Sapulpa High School Varsity Football Game versus Booker T. Washington at 7 p.m. at the George F. Collins stadium in Sapulpa. Let’s root to keep that Big Blue winning streak going and to beat the Washington Hornets! Kellyville High School Varsity Football Game versus Henryetta at 7 p.m. in Kellyville. Root for those Ponies to beat the Henryetta Hens! 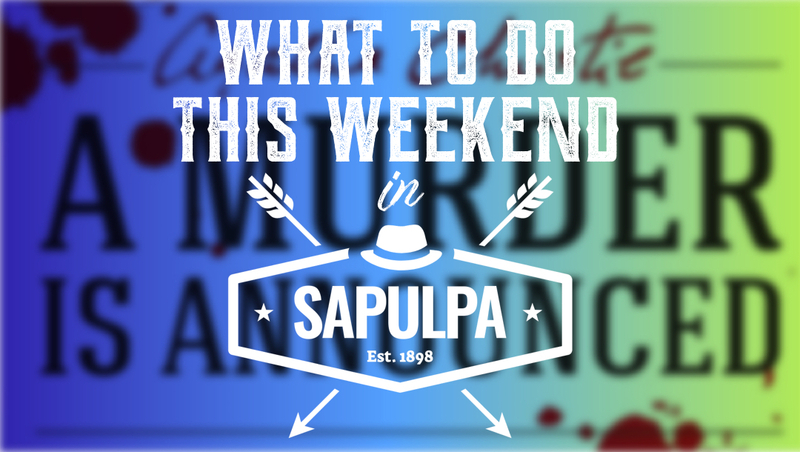 Agatha Christie’s “A Murder Is Announced” at 7:30 p.m. at the Sapulpa Community Theater, 124 South Water in Sapulpa. Make sure to catch this “classic Agatha Christie puzzle of mixed motives, concealed identities, and twists and turns” at our local theater! For tickets, call 918-227-2169 or visit www.our.show/murderisannounced.com. For more information please visit their Facebook page here. Tai Chi: Moving for Better Balance, a FREE 12-week program at 10:30 a.m. on Saturdays at the Good Shepherd Episcopal Church, 1420 East Dewey Avenue. This class will be taught by certified Master Instructor Gina Wozencraft. For more information on this program, please call Ms. Wozencraft at the Creek County Health Department in Sapulpa at 918-224-5531, extension 284. Gym Rats Lock-In hosted by Sapulpa Boys Basketball from 6 p.m. to 6 a.m. at the Chieftain Center. Don’t let your son miss this all-night boys basketball clinic which includes watching the high school football game, basketball drills, pizza, movies, various games, and a chance to hang out with with the high school basketball team! This event is open to 1st through 8th grade boys, and the cost is $45 a person or $80 for two. For questions and registration call Coach Rickey Bruner at 918-853-2448 or email him at rbruner@sapulpaps.org. For more information, visit their Facebook page here. Last showing of Agatha Christie’s “A Murder Is Announced” at 2 p.m. at the Sapulpa Community Theater, 124 South Water in Sapulpa. Make sure to catch this “classic Agatha Christie puzzle of mixed motives, concealed identities, and twists and turns” at our local theater! For tickets, call 918-227-2169 or visit www.our.show/murderisannounced.com. For more information please visit their Facebook page here.